If there’s one piece of advice that you need to know on home defense tactics in an SHTF or disaster scenario, it’s that having a plan and strategy in place is far more important than the equipment or weapons that you have. In other words, it doesn’t matter what gun you’re using for home defense or how creative you manage to booby trap your home to resist intruders. What does matter, on the other hand, is your mindset and the plan that you put into place. This is what will contribute the most to you and your family’s survival. So what does your home defense strategy need to consist of? A number of things, from your mindset to your strategies to how well you plan ahead and to the specific defensive tactics that you use. The home defense tactics, in particular, are what we are going to focus on in this article. It’s very important for you to learn about these kinds of home defense tactics because in a prepping or SHTF scenario in your area, such as an EMP attack or an economic collapse or a natural disaster, your house very well may come under attack if anybody has any reason to suspect that you have items of value, such as food, water, first aid items, or other equipment. After the stores and restaurants have been looted, houses are what desperate people will turn to next. They will also most likely work in groups and be fairly organized (not to mention armed), which makes knowing about the various home defense strategies even more important for you. The first home defense tactic to know is a rather obvious one, but also one that is definitely worth noting. You need to fortify each of the entry and exit points at your home, and preferably, you’ll do this BEFORE an SHTF situation has occurred. 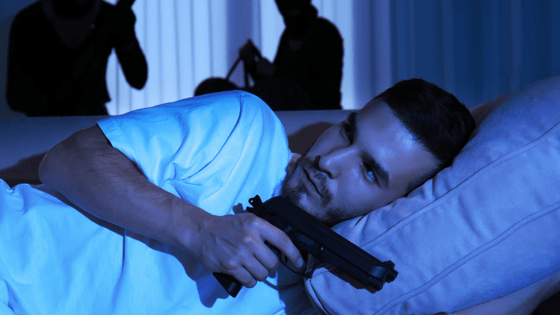 This way, you’re not just preparing for SHTF disasters, you’re preparing for home invasions that could occur in a non-SHTF or disaster scenario as well. The most vulnerable entry points in your home, without question, are your doors and your windows. Therefore, these should be what you fortify first. For your windows, normal glass is far too easy to break through. A rock or rifle/shotgun stock will make short work of it. In other words, it’s not really even a barrier against a home invader. Fortunately, you can fortify your windows. A more expensive but highly effective option is to replace the glass windows with acrylic glass. The acrylic glass looks very similar to normal glass, but it also requires significantly more force to break. Barring this option, the next best choice will be to fortify your windows with chicken wire after an SHTF scenario has occurred. For the doors, the locks and hinges will need to be replaced with heavy duty alternates. You may also want to consider taking things an even bigger step forward by replacing the door itself with a steel door, or at least the doors that are leading outside, which can much better resist being brought down by a sledgehammer or an ax. Sandbags have been around a long time for a reason: they work! Sandbags are seriously one of the most effective defensive fortifications out there because they are so efficient at absorbing ammunition. Even better about sandbags is the fact that they are cheap and easy to store. You store the bags and the sand separately, and then fill them up with the time comes to fortify your house. The best places to set up sandbags will be behind your doors and windows because those are the places where any attacking force is going to concentrate most of their fire. Your #1 goal when defending your home in an SHTF scenario must be to keep any and all attackers outside of your house at all times. Furthermore, you want to keep them as far away from your house as possible. How do you go about accomplishing this? The answer is simple: you need to create a defensive perimeter around your home. No, you won’t be creating this perimeter right now, because turning your front lawn into a war zone is going to look rather odd (to say the least) in a normal looking neighborhood. Instead, you would need to purchase the materials needed to build this perimeter, and then construct the perimeter with those materials after the grid has gone down. The easiest to build and most effective defensive perimeter to create will be a barbed wire fence. A barbed wire fence is not impossible to breach by any means, but it provides a physical barrier to any attacking force. Furthermore, it’s something that’s going to cause any home intruder or attacking force to think twice before they attempt to attack your home. If your house looks too difficult to take easily, they’re going to move on to the next house. Building a barbed wire fence is simple. You just drive stakes or poles into the ground, and then wrap barbed wire between them. The fence will need to be high enough so that people cannot simply walk over it. Meanwhile, you can further add to the defense by setting up a layer of nail boards in front of or behind the fence, something else that’s really going to cause your attackers to think twice. And if you’re really wanting to bolster your defense, you can set up multiple layers of barbed wire fences and nail boards as well. An attack on your home may not be so inevitable after all if you set up that kind of an attack. Fake cover simply refers to places that people will instinctively dive under when they come under fire, but that won’t really do a good job of stopping incoming bullets. So to put this concept into fruition, what you’ll do is essentially set up a maze of nail boards and barbed wire fencing around your home. Attackers will naturally take the path of least resistance, so they’ll follow the ‘maze’ that you set. At various points in the maze, you can have fake cover set up, such as a ditch or a cardboard box, something that an invader will dive behind in a vain attempt for cover. This way, you can predict where the attacking force will move. As they move or run down the path that you’ve set to avoid the barbed wire and nail boards, you can then take aim and place your shots at the area of fake cover that they’ll be running for. Chances are very good that an attack won’t happen in the middle of the day, but rather at night. There are three essentials tips to know for night fighting. The first is you need to be alert. Either have a guard always watching, or have an alarm system set up (such as running a perimeter of paracord around your house with tin cans filled with pebbles attached to the paracord). Next, you should ideally have the ability to see in the darkness with night vision goggles. These are expensive, but if you can afford them, by all means, use them. Last but not least, you should have bright lights set up in the home that you can use to flash down over your front or back lawn. These big, bright lights will serve two primary purposes: they’ll blind your attackers and cause them to become disoriented, while also giving you a clear field of view around you. You’ll be able to get a few shots off at least before the attackers have any chance to fire back, at least not accurately. The very last thing that you want or need in a major disaster is for your very own neighbors to turn on you. This is why you will want to form alliances with them either before or right after the disaster has happened. That way you can work together to come to the other’s aid, to exchange resources, and to stay on the lookout for hostile forces. And while it really is a different subject entirely, if you manage to bring your entire neighborhood together as a united force, the chances of any home in that neighborhood behind attacked are drastically reduced. A safe room is simply any hidden room in your home that you can fall back to when things get bad and the defense of your home fails. It’s also a room where you can send members of your family while an attack is happening. Your safe room will need to be hidden, be locked and secure, and will also need to be stockpiled with at least a three days supply of food and water. Enough sleeping space for each family member is also essential, along with sleeping equipment such as cots, mattresses, pillows, sleeping bags, or blankets. A safe room that is hidden under the staircase, in the attic, under the floors, or in the walls, will all work. What matters is that the door is locked and that it’s not painfully obvious. 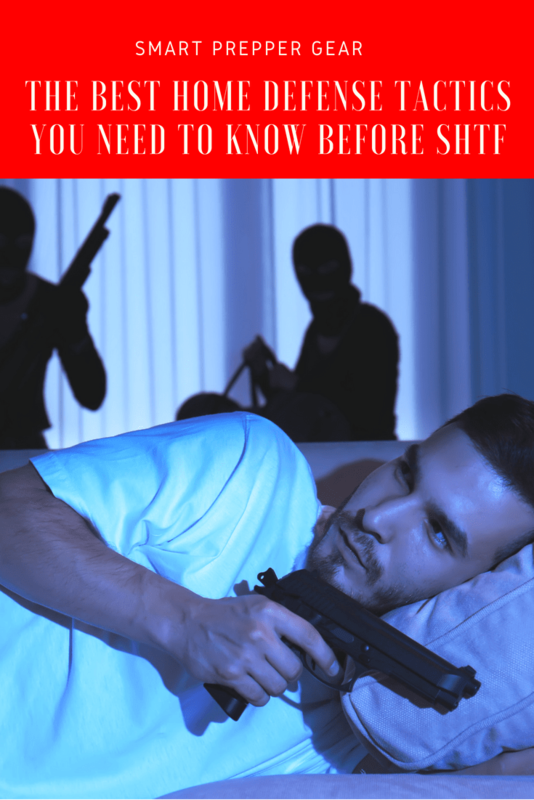 If you all need to hide in your safe room while the intruders rummage through the house in the event that your home defense efforts have failed, it needs to ensure that it actually keeps you all hidden. It could be that things get really bad to the point that you are forced to evacuate your home entirely rather than just falling back to a safe room. This is really a different topic entirely, since having an escape route also means you need to figure out a ‘bug out’ destination along with routes for getting to that destination. But for now, what this means is you need to have an emergency option should the collapse of your home be inevitable. If the attack is too overwhelming, having a plan to escape the home quickly needs to be in order. Each of the home defense tactics that we have covered here today is absolutely vital for you to know for any grid down or disaster scenario. Remember, in an extended disaster scenario, an attack of some kind on your house is more inevitable then it is possible. You have to get ready, and the best way to get ready is to focus on developing a plan with solid self-defense strategies and tactics just like what you have learned here today.